Most professionally designed gardens consist of a series of defined areas, each set aside for a different purpose. 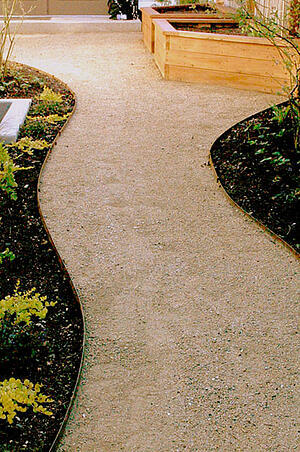 Using quality landscape edging accentuates each landscape area, outlining its shape and form with crisp, clean lines. 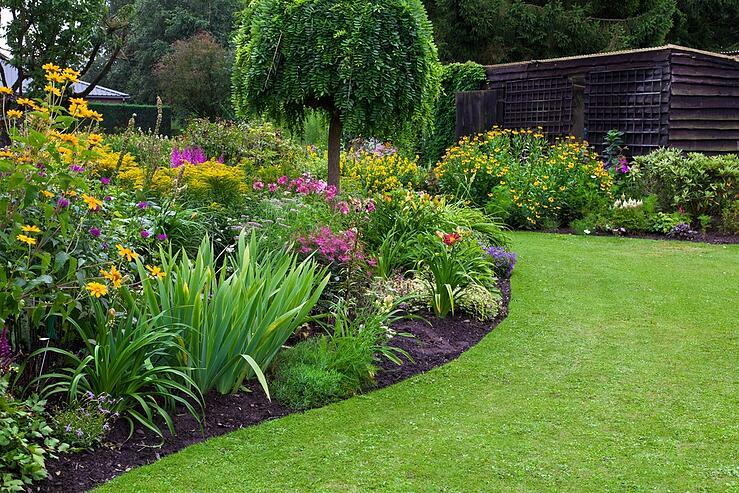 Edging can also provide direction in your landscape — leading the eye to the next garden focal point. From a utilitarian standpoint, landscape edging keeps grass from spreading into your garden beds and keeps soil and mulch in the garden from spilling onto the lawn. Edging can even help corral loose material, such as gravel, ensuring it doesn’t fall out of its designated path. The best part about edging is that when it is correctly installed, it can handle the wheels of a mower to ensure manicured edges, eliminating the need for additional string trimming or weed whacking. When considering the styles of edging to choose for your landscape, there are four distinct materials we typically use: steel, natural, concrete and plastic. You want to choose quality landscape edging that coordinates with your overall design scheme and will provide long-lasting contour to your beds. Steel edging provides an ideal edge because of its strength, durability and flexibility. It subtly accents the landscape with clean lines and minimal intrusion, won’t rot or become brittle in cold weather, resists ground movement, withstands routine landscape maintenance with its uniform thickness and weight (a mower can be run right along its edge) and installs fairly quickly and easily. Steel edging is popular in Idaho Falls because it goes well with our trendy, mountain-inspired, rustic landscape designs. The steel edging material is 4 inches tall and 1/8 inch thick. It sinks down to the grass line, creating a sharp, fine line that holds well. To install it, we cut a 4-inch line in the ground and tap the edging in using 18-inch rebar spikes to secure the edge. Pros: Steel edging is popular and easy to install because it comes in straight, 20-foot sections. Maintenance is minimal because if it lifts up at all, it can be easily hammered back down. If you are changing your bed shape, you can easily pull this edging up and reshape it to match your new bed shape. Cons: Steel is the second most expensive edging of the four options behind concrete, running at roughly $3.00 to $3.50 a foot. A natural edge uses the existing edge of the bed to create an eco-friendly line for the perfect barrier between flower beds and lawns. While the job can be done by hand using an edging spade, the 6-inch angled edge can also be cut directly into the earth using an edging machine or a bed shaper attachment that connects to the front of a mower. To maintain the lawn, mowers can easily run with their wheels in the angled area in order to cut the turf right up to the edge, eliminating extra trimming needs. 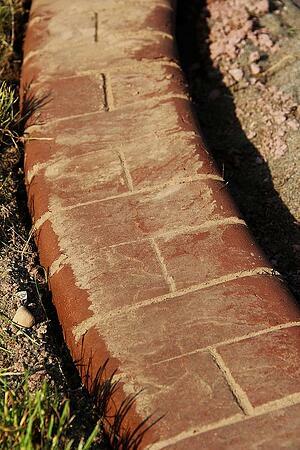 Natural edges do need to be cleaned up each year to maintain their shape and form. Pros: Natural edging is the second most popular edging type in Idaho Falls, behind steel edging. Mower blades cut safely over the edge—no risk of damaging the edging material or the mower blades, no need to invest in materials. Bed shapes can be easily changed by digging a new edge. Natural edging is the third most expensive option compared to steel, concrete and plastic edging, so it’s relatively affordable. Cons: We normally have to clean up natural edges annually as a service, so they require a bit more maintenance. Concrete edging provides beds with a 6-inch wide flat top that can be both decorative and functional. Just like other concrete surfaces, it can be colored and stamped to match your home and landscape design hues. While concrete edging can be poured by hand, many professionals today use a curb machine that molds and creates the edge as it lays the concrete. Mower wheels run right on the concrete edge to help avoid extra trimming. This permanent look is a long-term edging solution. Pros: Concrete edging can be ornamental, colored and embellished to match your home or landscape. Cons: Concrete edging is the most expensive edging option, starting at $4 per foot or 25 percent more overall compared to steel edging. Concrete edging also can settle and crack, requiring maintenance or repairs. As a permanent option, concrete edging can’t be easily moved if you want to change the shape of your beds. Plastic edging is the most affordable edging style. While it comes in many grades, the least expensive option can look cheap if not properly installed. It’s the most practical edging solution available. Pros: Plastic edging is the least expensive way to get a landscape edge. Cons: While plastic edging is a cheaper option, it tends to require more installation time because the edging material itself doesn’t always unroll as straightly or neatly as steel edging. Because of this, plastic can also lift up out of the ground more easily, causing grass to grow right through or underneath it, letting it sneak into your beds. Plastic edging is the least most popular type of edging in Idaho Falls. All four of these quality landscape edging options tend to take about the same amount of installation time, within approximately 10 percent of each other, although plastic does take longer than steel to install because we have to work with the material. So any option can be installed professionally and smoothly to give your landscape an edge. Let Outback Landscape help you choose the perfect landscape edging to accentuate your property. Contact our experts at 208-656-3220, or fill out the contact form to set up a no-obligation meeting with one of our team members. Want FREE Weekly Landscape Tips & Ideas? You can request a complimentary consultation or estimate by completing the form below.